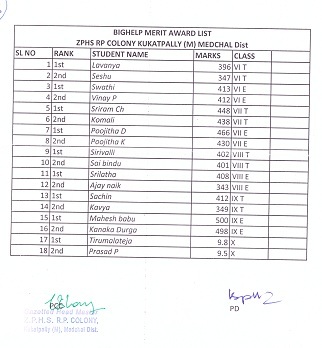 This Merit award has been established by Bighelp For Education to foster a competitive spirit among students studying in schools under R.P. Colony project located in R.P. Colony, Jagathgirigutta, Medchal District of Telangana state. This award considers all students equally irrespective of their individual financial strength, cast or religion. This endeavour sends a message among all students that every child is capable of achieving highest rank regardless of their school, gender, class, race, religion or disability. 1. Zilla Parishad High School, R.P. Colony.